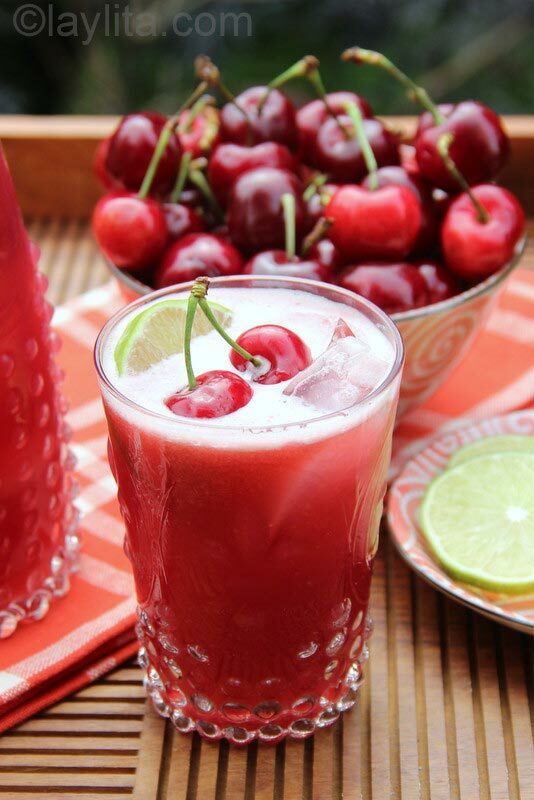 This is my recipe for a quick and easy homemade cherry limeade drink, it’s made with fresh cherries, limes, water and sugar (or honey). I’m finally home from my amazing summer trip to Ecuador. Even though I already miss Ecuador, I am happy to be back (and in my kitchen where I know where everything is). I am also very happy that September is turning out to be a great month weather-wise for Seattle and that the farmers markets still have a lot of delicious summer fruits & vegetables. Summer is the best time to be in Seattle and I’m lucky to get a final taste of it before it ends. 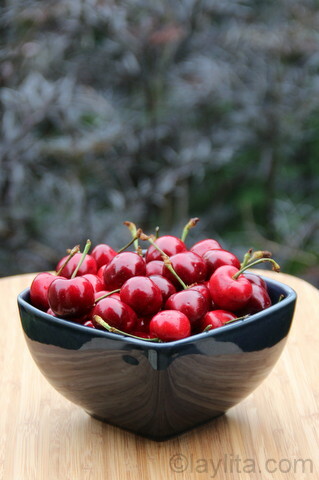 Cherries are definitely a sign of summer in the Pacific Northwest. 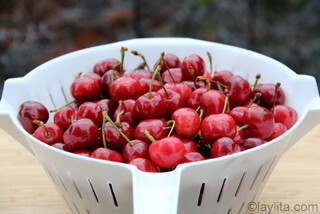 In May, you can start to find cherries from California, but in the PNW, cherries seem to be at their peak in August. 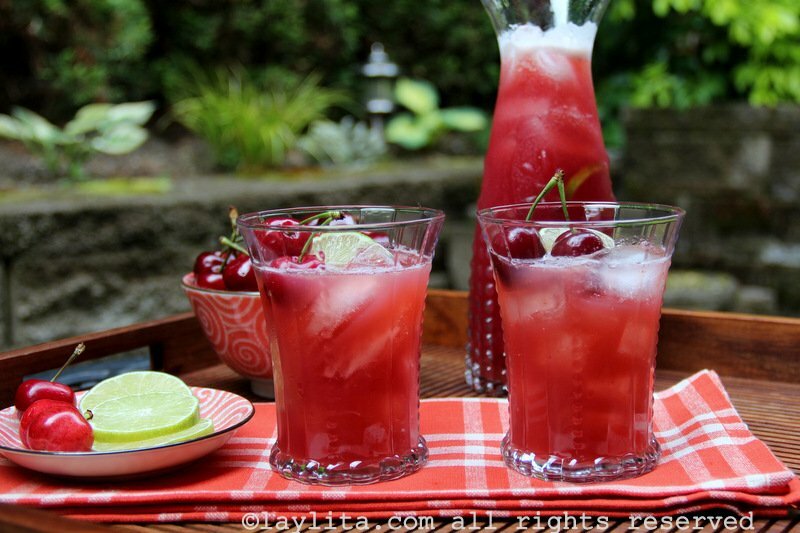 Homemade cherry limeade recipe made with fresh cherries, limes, water and sugar (or honey). 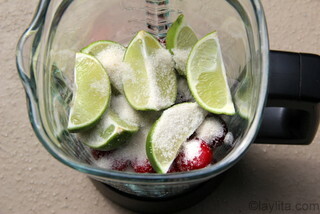 Combine the cherries and limes in the blender with the sugar and 2 cups of water. You can also add some ice if you want it extra cold. Blend until all the ingredients are pureed. 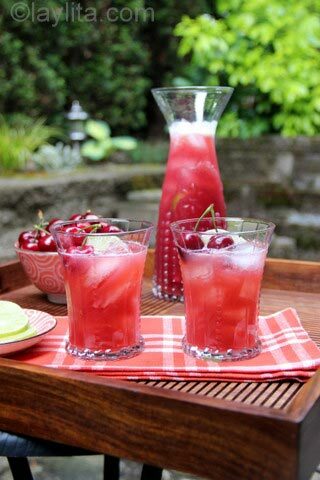 Serve cold or with ice garnished with cherries and lime slices. 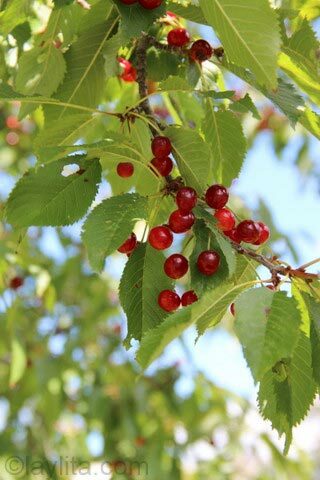 Cherries were a rare treat when I was a kid in Ecuador; they weren’t common, so as with most things that you can’t have on demand, I really looked forward to the occasions when we did get them. 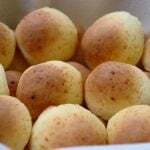 It’s funny because now I see them in most markets in Ecuador, but growing up, they were scarcer. We did have a variation of cherries called Surinam cherries that grew on our farm, but they have a very different flavor than traditional cherries – delicious, but different: tangier with a slight hint of bitterness and a larger pit.Last summer while hiking in the French Alps, we found a tree full of ripe wild cherries, they were bright red, very sweet, and rounder/smaller than the cherries we are used to here. Whenever I buy cherries my kids tend to eat them until they are full of them. 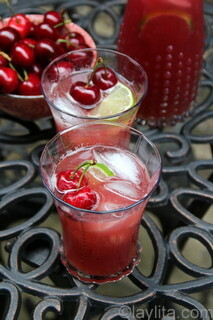 Then they ask me to make limeade (or lemonade) with the cherries that are left. 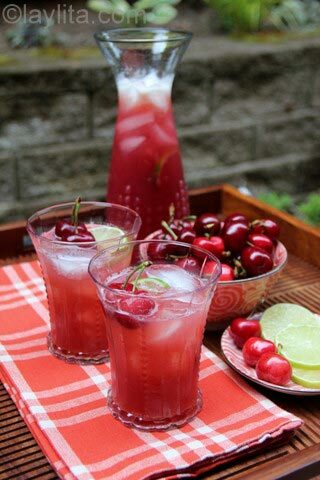 This recipe for cherry limeade is very similar to the recipe for strawberry lemonade that I posted at the beginning of summer. 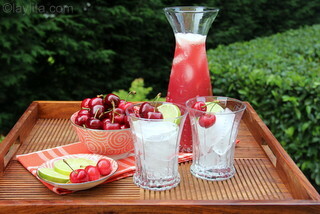 The cherry limeade is made by blending pitted cherries with a couple of limes, water, and sugar. 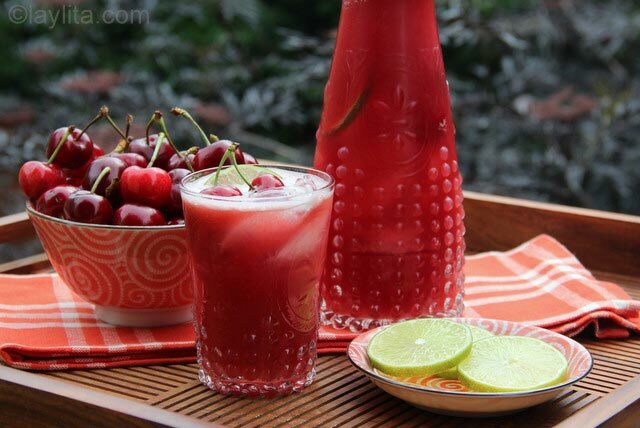 It’s a very quick way to make limeade since you don’t have to juice a bunch of limes, the only time consuming part is removing the pits from the cherries. 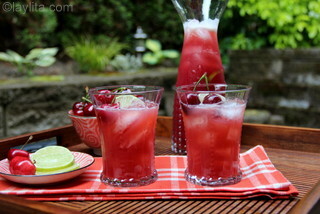 As mentioned in the strawberry lemonade and limeade recipes, when you make limeade using the blender you need to drink it the same day as it does get bitter by the next day. 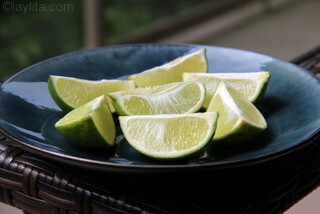 Even the freshly made limeade has a hint of bitterness due to the fact that whole lime (peel, pith, seeds and all) are used. Based on the feedback I’ve received it seems like most people enjoy it, but for a few it’s just not their thing. If you’re not sure try making the limeade first to test it, after all you’ll only be using a couple of limes or just one if you make a half-batch. For those that do like the limeade prepared this way, it’s usually consumed very quickly. For a cocktail version just add some vodka or tequila. 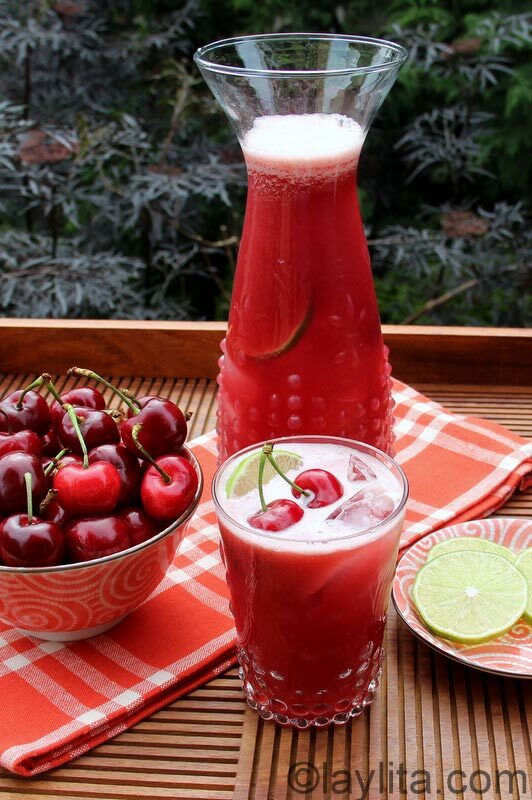 There’s nothing more refreshing than a cold glass of homemade cherry limeade to enjoy the last days of summer! the third row down of pics, first picture on left – that doesn’t look like a cherry?!? 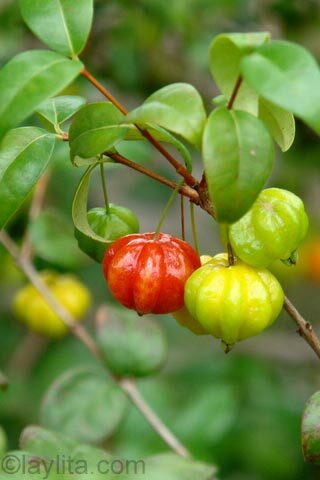 Wow the caption says its a Surinam cherry from Ecuador. I had no idea cherries looked like that. They look yummy. Would never have thought that fruit could be a cherry it looks nothing like most cherries. I must have too much time on my hands…. This is FANTASTIC! Drinking one as a cocktail with vodka right now. Thanks so much for sharing your recipe! Love this homemade recipe! The lime and cherry seasons are polar opposites of each other where I’m at. So I used about 8 key limes. 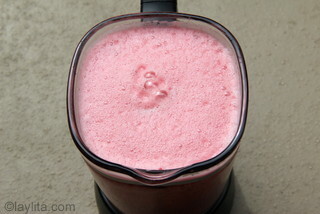 I also dont have a conventional blender but the submergable one I do have worked fine with the right attachment blade. 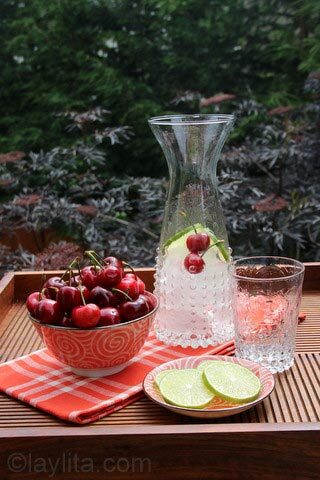 Do you use sweet or sour cherries? 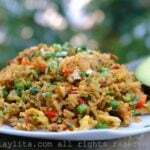 just wondering do you use the peel of the lime also? You out do yourself all the time…. Hmmm – looks so incredibly refreshing and delicious of Course. 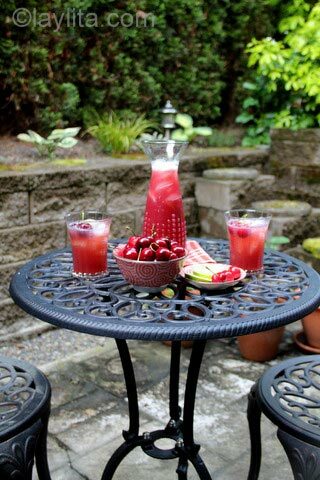 Hi Liz – Frozen cherries will work fine!